Jr. Cool Vest™ is IRONWEAR’s ™ new patented weighted vest designed exclusively for children. The Jr. Cool Vest™ was created to make wearing a weighted vest more fun, comfortable and effective. *The Jr. 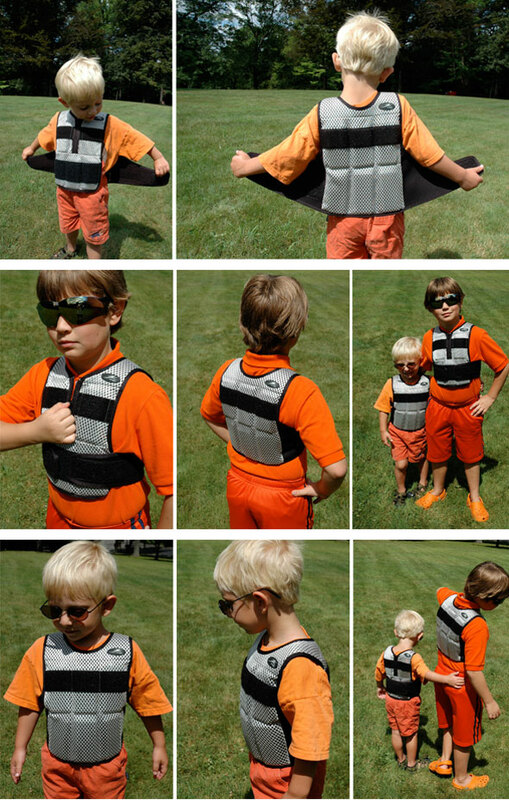 Cool Vest™ is shown with the belts in front and back on a 4 year old and his 10 year old brother who weighs 100lbs. The 10 year old can wear a regular cool, club, or speed vest also. Jr. Cool Vest™ is part of IRONWEAR’s ™ Cool Vest Line™, so in addition to the Jr. Cool Vest™ there are matching adult Cool Vests™. This makes it possible for both the child and the caregiver to wear the same style vest. 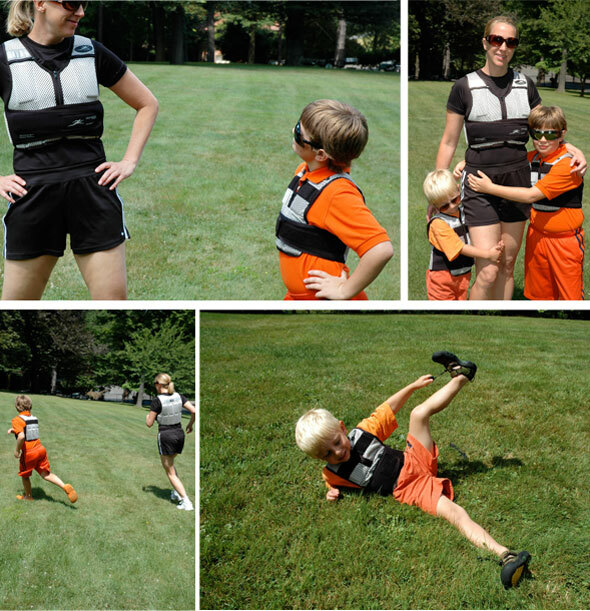 By wearing matching vests the child may have an easier time accepting the weighted vest. A caregiver who wears a weighted vest also increases their understanding of the effects of wearing weights. As a side benefit the caregiver can use their weighted vest to improve their own physical condition. Jr. Cool Vest’s™ unique design contours to the shape of a child’s body, allows air to flow through it to keep the child comfortable, expands to support a wide range of sizes to grow with the child, is safer for the child and others, and is packed with features to make wearing the Jr. Cool Vest™ fun. Jr. Cool Vest™ contours to the shape of the child’s body and bends with their every move. The Jr. Cool Vest™ incorporates all the latest patented IRONWEAR™ form fitting features. The ultra thin Contour-fit™ design conforms to the curves of the back, front and sides. The patented soft Flex-metal™ weights bend easily to constantly match the movements of the body. Jr. 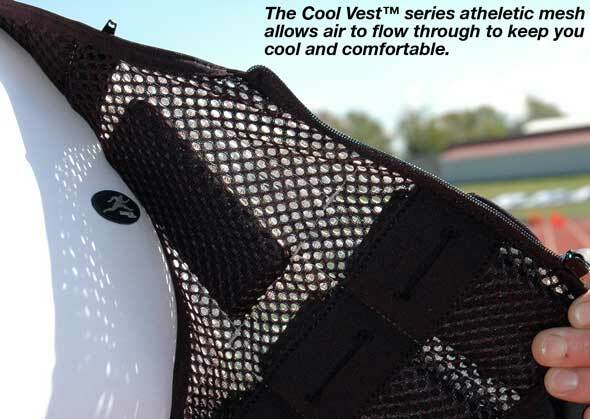 Cool Vest™ allows air to flow through, to help keep the child comfortable. The Jr. Cool Vest™ is constructed of soft athletic mesh that is durable and easy to clean. The design helps to keep the child from overheating. Jr. Cool Vest™ expands easily to accommodate a wide range of sizes. The Jr. Cool Vest™ adjusts easily to fit most children between 2 and 9 years of age, weighing less than 100 pounds. The unique design allows the Jr. Cool Vest™ to fit the child’s growing body well for years, so you do not need to buy new vests as the child grows or to buy multiple vest sizes to fit different children. Jr. Cool Vest™ unique shoulder design keeps the vest in position comfortably. The Jr. Cool Vest™ has a zipper opening that allows the vest to slide over the child’s head and positions the vest properly on the child’s shoulders. The wide padded shoulder straps spread out the load to make carrying weight easier and less noticeable to the child. Jr. Cool Vest™ helps to support the child’s abdominal and back muscles. The Jr. Cool Vest™ incorporates IRONWEAR’s™ patented full waist support system. Two patented over-sized stretch belts snug the vest to the child’s body while not inhibiting their breathing or movements. Jr. Cool Vest™ Contour-fit™ design is ultra thin and snug so that the vest will not interfere with the movement of the child’s body. The padded shoulders provide maximum flexibility, support and comfort. The Contour-fit™system makes it possible for the child to raise their arms completely, which means the vest can be used for all activities and play. The Jr. Cool Vest’s™ thin design can also be worn easily over or under clothing. Jr. Cool Vest™ is easy to clean. The Jr. Cool Vest™ can be hand washed with the weights inside or machine washed with the weights removed. The porous design also allows the vest to dry quickly. Jr. Cool Vest’s™ Stretch-fit™inner pockets hold the weights securely on all sides and keep them from shifting. The inner pocket design makes it impossible for the weights to come loose while you exercise. Because no hardware or Velcro is used to hold the weights in place, the vest is safer, longer lasting, thinner and more flexible. Jr. 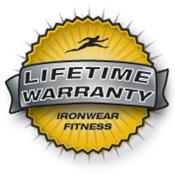 Cool Vest™ accepts IRONWEAR’s™ patented Flex-metal™ weights which are the safest, most comfortable and best fitting weights possible. The weights are thin and flexible and contour to the shape of the child. In case of a fall the interchangeable weights act as padding to protect the child and those around them. Jr. Cool Vest™ has 11 weight pockets to uniformly distribute the weight over the child’s torso. Each weight pocket will accept one or two ½ pound soft Flex-metal™ weights, or up to four ¼ pound soft Flex-metal™ weights. The vest is available as a shell or with ¼ or ½ pound weights. Vests supplied with weights have one weight per pocket. The vest shell itself weights approximately .5 pounds. 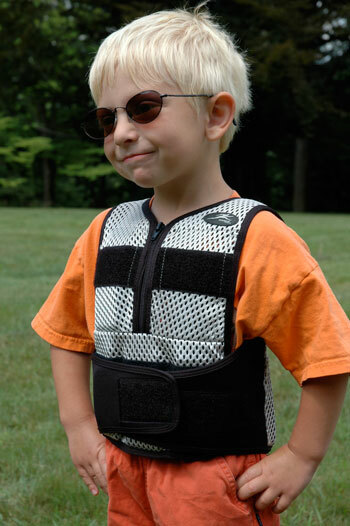 The vest can be adjusted from .5 to 12 pounds by adding Flex-metal™ weights. Jr. Cool Vest™ is supplied at approximately 6 pounds with a single layer of ½ pound Flex-metal™ weights, but can be adjusted from .5 pound up to 12 pounds by removing or adding additional Flex-metal™ weights. Jr. 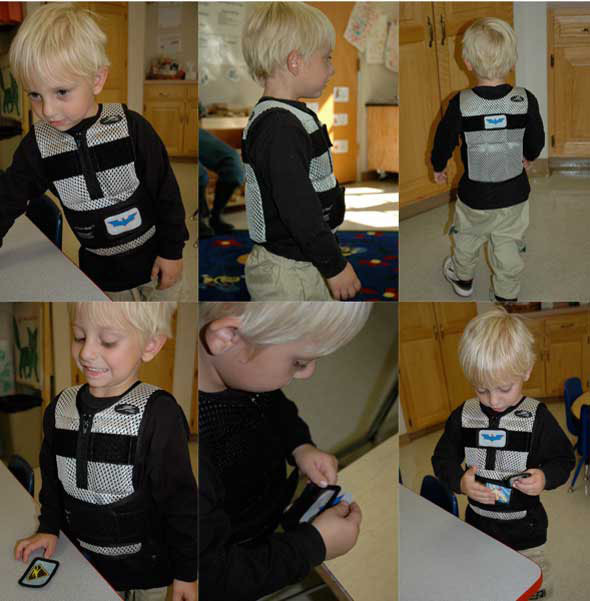 Cool Vest™ can be worn with the belts secured in the front so the child can put the vest on or take it off. Also the vest can be worn with the belts secured in the back to restrict removal by the child. Jr. Cool Vest™ patented accessory system has many unique features. The vest includes intergrated loop fasteners on the front and back onto which many things can be attached. The vest is supplied with 5 window holders for personalizing the vest. You can put in the child’s name, their favorite color, logo of their favorite super hero, or their own artwork in the holders that can be positioned all over the vest. Jr. Cool Vest™ is set up to be fun with all kind of play accessories. You can make your own and Velcro them on or consider the different cape and hood accessories that we offer. These accessories pull off easily to help keep the child safe and excited about wearing their vest. "I wanted to let you know that of the two waist/ankle belt models you sent, the smallest one worked the best for Ben. Right now the vest is working so well, that we have not needed to use the ankle weights. But, I am happy to have them for an option when he wants a change. They are sooo much better than the ankle weights I can pick up locally!